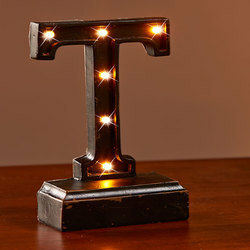 This Lighted Monogram Plaque brightens up a desk, shelf or more with an initial that's personal to you. Reminiscent of a vintage marquee sign, this industrial-style accent illuminates with LED lights. On/off switch. Requires 2 "AAA" batteries. Approx. 4-3/8"W x 1-3/4"D x 6-3/4"H. Cold cast ceramic. Fun accent light you can display anywhere Inspired by the look of famous theater signage Details: Approx. 4-3/8"W x 1-3/4"D x 6-3/4"H Cold cast ceramic Battery operated Note:Currently, we do not ship to AP, AE, AA, APO, FPO, HI, and AK addresses, as well as PO boxes.